A few years ago, a friend of mine who was born or raised in Shreveport, called me and said “I have to ask you a question”. It was Christmas time and they had gone to her husband’s Christmas party and it had been catered by a catering company from South Louisiana. She says “The food was good. They served jambalaya and gumbo and…and…potato salad. No barbecue. Did they get confused?” I laughed first and then told her that Cajuns eat potato salad with nearly everything. Etouffee…potato salad. 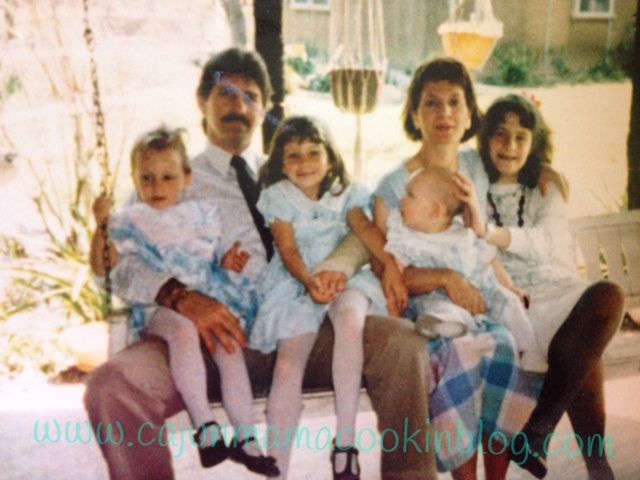 Chicken fricassee…potato salad. Rice and gravy and..yes, potato salad. This falls under the list of things that I never considered abnormal. Actually, I never considered it at all. 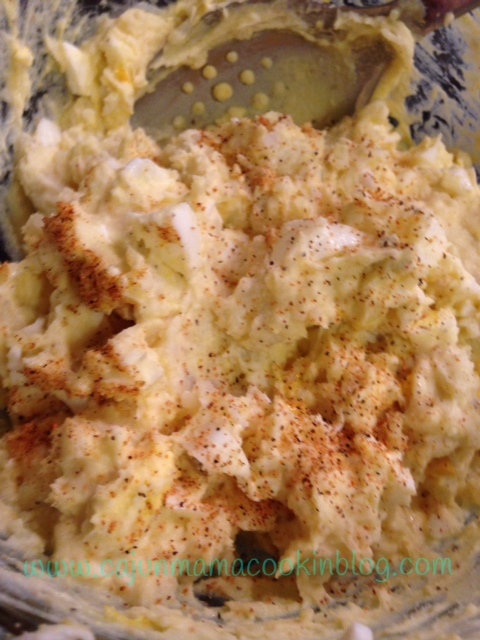 I love potato salad with most stuff and thought my family must like it this way. Nope. Apparently it is a colloquial thing. I will not say it is a “Cajun” thing or a “South Louisiana” thing. I have had some people say “you are from Alexandria and that is not South Louisiana.” Fair enough. I have had people say “Alexandria and Marksville are both considered Central Louisiana”. Ya’ll…I am not going to claim to know. I think being Cajun is more a state of mind. I know people who live in Baton Rouge who don’t consider themselves Cajun. I have explained before that my family are first generation Alexandrians. This means, my parents were both born and raised in Avoyelles Parish (Marksville by the way of Blue Town and Broulliette to be precise) and moved to Alex. after getting married. So, we did most things, cooked most things, adhered to the customs that their families adhered too. So, I will not claim to know why we eat potato salad with more things than not. I don’t know where this comes from. I just know that I grew up thinking it was just what you did and I love me some potato salad and I never questioned it. So today, I am going to tell ya’ll how I make my potato salad. I imagine most of ya’ll have a potato salad recipe, but some of you may not. Maybe you need a little potato salad inspiration. I know my Momou and Momee made very similar yet distinctly different potato salads. 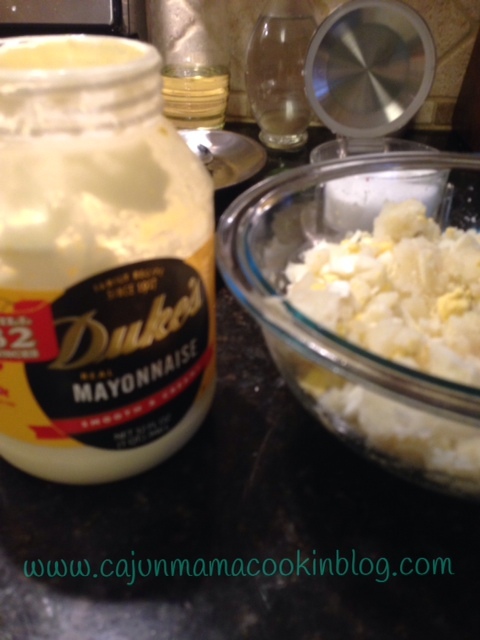 I liked them both and now my potato salad combines the best of both worlds. My favorite potato salad memory is the colored eggs that ended up in the potato salad on Easter Sunday. 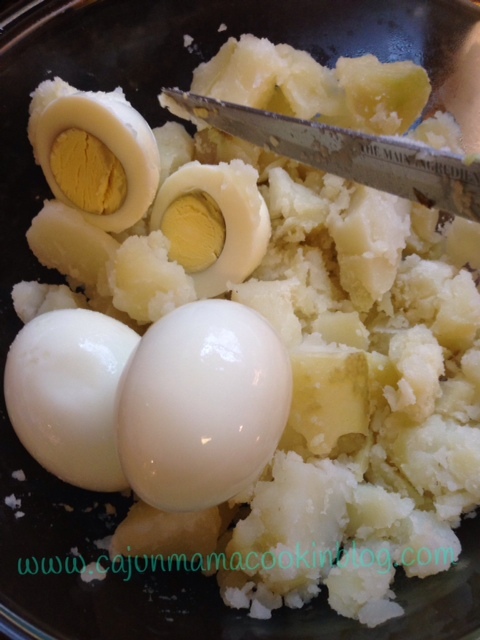 We would paque eggs and the loser eggs would be peeled and then put in the potato salad. I always thought it was fun and colorful as a kiddo. I know that potato salad always tasted so good with the cuchon de lait and dirty rice. Bring on the colorful potato salad. For those who may not know what paque (pronounced “pock”) eggs means…that is where you hold a dyed Easter egg in your hand and someone else does the same and you knock the tops of the eggs together. If you crack their egg, you win and vice versa. It was good Easter fun I tell you. My kids love to paque some eggs. Anyhow, back to potato salad. 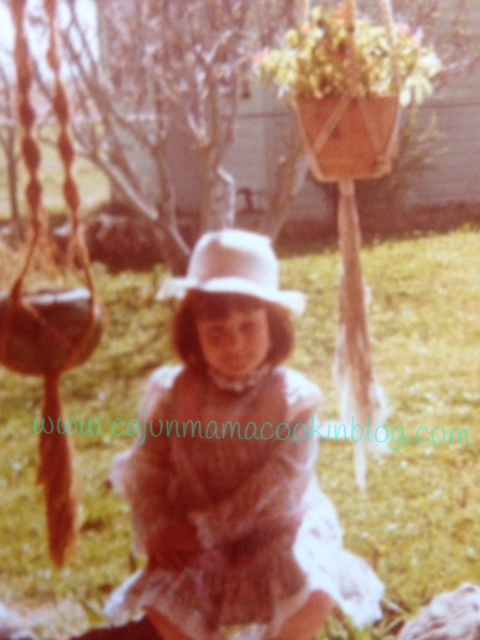 Momou’s potato salad was always a little more yellow than Momee’s. Her potatoes were always a little more substantial where as the potatoes in Momee’s were a little softer, a little more mashed. Her potato salad usually had some pickles or pickle relish in it. Momou’s had more pepper in it. Mine falls somewhere in between the two and I tend to add Tony’s to mine, like my Daddy does. I remember making potato salad in college and after we got married and BD would always say “yeah, something is missing. It is good but…” Finally at 38, I think I am close to getting it the way we like it. But we have much higher expectations for potato salad I do believe. As I type this, I realize how much thought and effort seems to be put into it. I guess when you eat something so frequently with so many main dishes, it should be good!! Maybe it is just me? Forgive me if I am taking liberties by preaching potato salad to ya’ll. I do so love it and feel sad for anyone who might be at a loss about how to make it. Or God forbid, buys it from the store?!! I must stop that now. If I can save one person from store bought potato salad, then my work here is done. Namaste. Peace on Earth. Homemade potato salad for all!!! 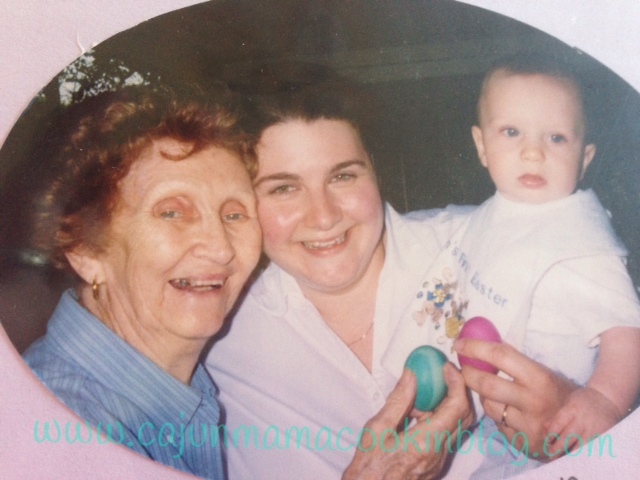 Easter Sunday at Momou’s…Ben’s first Easter and his intro into paquing. Pretty sure Momou won that match. Cut your potatoes into equal sized pieces. I usually half the potato and then quarter the halves. I peel the potatoes after they are boiled rather than before. That is what my mom and dad did so I do the same. Put your cut up potato pieces and the eggs in a pot and cover them amply with water. Bring them to a boil and then reduce heat as needed but keep them at a low boil until the potatoes are fork tender (for me typically about 20 minutes, give or take). You may prefer the potatoes to be less tender, so just use your judgement. When you feel they are ready, drain the potatoes and eggs in a colander. When you can, place the eggs in a bowl of cold water. Peel the eggs. Peel the potatoes. Add both to a medium size bowl. Now, add about 1/2 cup of mayonnaise and start out with a few squirts of mustard. Ya’ll, I wish I could be more precise but I go by how it looks (and tastes). Definitely add in some kosher salt and pepper as you stir. Stir in more mayo and mustard (gradually) and salt and pepper (a little Tony’s). Continue to do this until you feel it is just right. Or close. It is definitely a trial and error process, or at least it has been for me. When the potato salad is dressed and seasoned to your liking, sprinkle a little more Tony’s over the top for presentation. Yes. It is good. Yes, it will go with almost anything. Well…as far as I am concerned. And it always tastes better with colored eggs on Easter Sunday. Enjoy!!! Cajun is a mindset and you are definitely CAJUN! I am claiming it for you:) Love the all the photos! You know I love my visuals. This is my fave post so far. Aw thank you lolly!!!! Thanks for reading. That potato salad looks great! Will definitely have to give that one a try. Sometimes the simpler recipes end up being the best. It is the best!!! And I agree!! This is great! 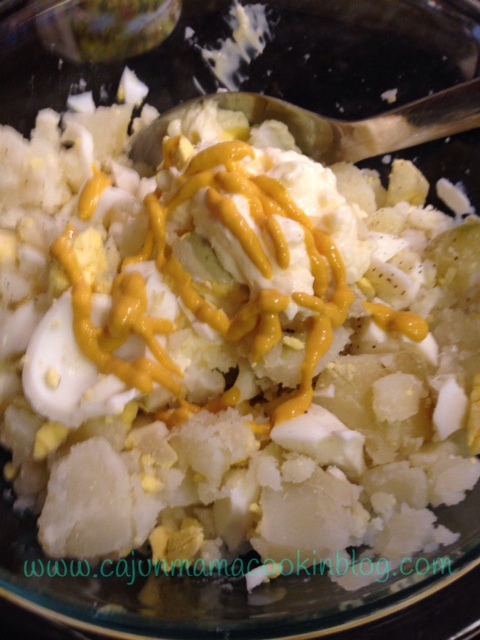 I’ve looked for and asked others from Louisiana about their potato salad, to find out how they do it, because I’ve wanted to do it the “right” (read Cajun) way. Thank you for the suggestions about what else y’all have it with … that helps! My husband likes it a certain way, more simple and mustardy, and I’ve learned to love it that way too because I love it with gumbo. The first time I had gumbo with potato salad was in Lake Charles at KD’s restaurant and was perplexed because … the rice is the starch, right? And I was raised with my parents putting a lot of extra stuff in their salads … sweet pickles, white and green onions … sometimes olives (and a neighbor introduced me to putting radishes in potato salad which I really do like and it gives me a purpose for radishes) but now, I’m proud to say, I do it just about like you, with the same ingredients! The only thing thing is sometimes I add dill pickles when my daughter is over. I canned dills a long time ago and used to add them to the potato salad when she was young so she misses that. That’s HER special memory, I guess! I grew up in Shreveport and we had potato salad with everything too. This sounds just like we make it. Yum. Oh that’s awesome. And yes yum! Making some today! That’s pretty much how I make my potato salad, except I peel my potatoes before I boil them. I NEVER buy or eat store bought. I only like my own. LOL I have adjusted my potato salad over the years. It used to be more mashed like my mama made it, but now I like to leave chunkier bits of potato in there. Works better if you let the potato cool before you mix because warm potatoes break up more. I’ve also started added choooed dill pickle in the last few years. I use the claussen brand and remove the seeds so the salad doesn’t get watery from them. It adds a nice little zip and texture. That’s a great idea! I’ll have to try it!! Thanks Rose!